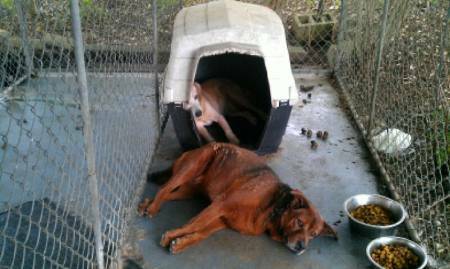 Hearts to the Rescue: *NASHVILLE , TN - URGENT!! 2 Dogs need IMMEDIATE home/foster - Owner is devastated! *NASHVILLE , TN - URGENT!! 2 Dogs need IMMEDIATE home/foster - Owner is devastated! back, they have been in this kennel for two months and are still both as cool as cucumbers!! The female is spayed, male is not neutered. both are middle aged and HEALTHY! Im begging for someone to take these guys! This man has been through SO much the past few years and these dogs are all he has left. It would mean the world to him to see these dogs safe and hopefully help him recover from his addiction. Please call the clinic, ask for DR DAVIS and let him know you are donating money to the NACORATO dogs, so that we can buy ourselves some additional time. Otherwise I HAVE TWO DAYS TO GET THEM a confirmed place to go. I realize Im sending this to some of you that dont normally take these breeds or dont normally crosspost at all but please crosspost the heck out of this! The vet, Dr Davis' phone number is 731-968-2531 please call and donate even $5 if you can, if we have left over money (the dogs have been there for two months so I doubt this will happen) we will use it to catch them up on vaccines, neuter the male and use for transport! If placement is not found for them, both dogs will be put down Friday, 5/25!! Time is of the essence!!! *From Laura: Hey all, a friend of mine is searching to find his uncle’s two dogs a home. They are at the vet in Lexington , TN , where his Uncle is from, but his Uncle is staying at the mission here in Nashville . He cannot pay his vet bill, so they have told him that if he cannot get them by this weekend they will have to put the dogs down. Although these two dogs mean the world to him because of personal troubles he MUST find them new homes. I have the name/address/ numbers of everyone at this clinic but in order to keep the vet clinic patient with all this please contact me and if you can help I will send out the information to you. I JUST CALLED AND SPOKE TO DR. DAVIS. HE HAS GIVEN ME TILL FRIDAY THE 25TH TO FIND THESE TWO GUYS A HOME. AFTER THAT THEY WILL BE EUTHANIZED. THEY HAVE BEEN THERE FOR OVER TWO MONTHS. HE IS NOT EXPECTING ANY PAYMENT FROM A RESCUE THAT TAKES THEM. SO THERE IS NO CONFUSION OR WASTED TIME PLEASE EMAIL ME AND LET ME KNOW IF YOU CAN GET ONE OR BOTH. I WOULD LIKE TO NOT SEPARATE THEM BUT IF YOU CAN TAKE ONLY ONE LETS GET THEM SAFE!!!!! The two dogs are; a 50 lb male Golden Retriever mixed breed, the other is a 60 lbs female Rottweiler/Chow mixed breed. In the mean time I will try and get some additional information on their personalities etc. We are on a SERIOUS time crunch here people! Please network the heck out of this! Email me ASAP if you have any openings whether they are permanent homes/foster or just temp.